Andy Ritchie loved stand-up comedy. He loved the form. He was easily the youngest touring comic I had ever seen when we met in the early 2000s and had such an ease on stage. He loved watching other comics succeed but he also delighted in watching terrible standup comedy. 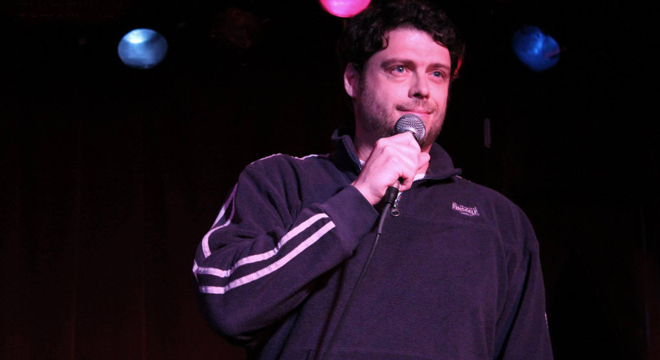 He worked for a prominent comedy booker before he moved to Austin and had amassed a collection of the most amazing unsolicited comedy submissions, mainly from people who filmed themselves in their own homes. We’d spend hours watching and rewatching clips after a night out. Eventually, along with Charlie Sotelo, he would curate a program of these clips that would play at the Alamo Drafthouse to full houses. Losing Andy Ritchie this year was a huge blow. The former Funniest Person in Austin winner had moved to Los Angeles a few years prior but he remained a legend of the comedy scene here. Andy always had a new idea. Whether it was a tag for your joke, a concept for a short film, or a bit that was just for you, his mind was always working and he was invariably the funniest guy in the room. When I think about Andy, I’m always reminded by how much he supported me in my own flirtations with comedy. I’m not a standup, but he urged me to host for him shortly after moving to Austin. He was so generous in that way. It was one of the most fun/terrifying experiences of my life. I also think about little moments like how we played Mad Libs in his apartment when my sister was visiting and he came up with the meaningless “Skittles Griddles” for a proper noun. It was so stupid and so great that we still laugh about it. I’ll miss Andy for as long as I’m alive, but I’m lucky to be able to hear several of his performances online. In addition to his comedy album, he appeared in a variety of short films, webisodes, and feature films. He also has a Twitter feed that’s filled with gems and one-liners that is well worth your time. As Nick Swardson said of Andy, “He was hilarious. He stood out above everyone. We both admired him and wanted to be his friend.” I think that’s true for almost everyone I know. We all admired him. And many of us were lucky enough to call him a friend. John Merriman is an award winning filmmaker, actor and comedy fan. He starred in the New York Times Critic’s Pick YOU HURT MY FEELINGS, the LA Film Fest winning feature GRETCHEN>, and the indie comedies PICTURES OF SUPERHEROES and CINEMA SIX Six. He is the official blogger for the Moontower Comedy and Oddity Festival and co-hosts the festival’s online series Inside Joke where he has interviewed comedy luminaries including Steven Wright, Marc Maron, and Maria Bamford.